10 'Exam folders' cover each exam task in depth and provide practical advice. 5 'Writing folders' give practice in exam tasks to help students maximise exam success. Ready-to-use Teacher's Book activities save teachers time and make the book even more user-friendly. 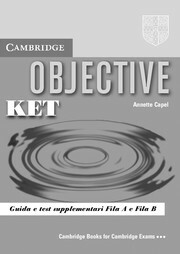 The new Practice Test Booklet with Audio CD contains two complete practice tests for the KET for Schools test.